The AdderLink X2-MultiScreen extends two high quality video signals, together with keyboard and mouse signals, multiple RS232 signals and high quality audio up to 300m/1000ft over Category 5 or higher twisted pair cable. 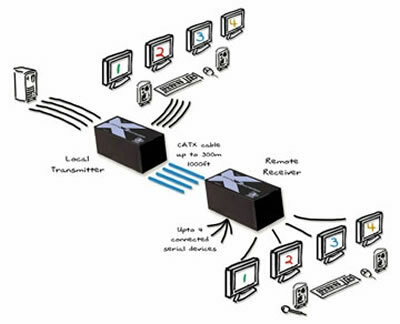 In addition to this functionality, the X2-MS2 provides a local feed through port for control of computers at the local computer end. Multiple video extension can be used in a wide variety of scenarios where it is either inhospitable or impractical to place both the machine and control console in the same place. The X2-MultiScreen extender is ideal for use in industrial process and control room environments, financial dealing rooms, emergency services control rooms, broadcast production studios, security environments or any multiple touch screen applications. The Adder X2-MS2 achieves video resolutions of 1600 x 1200 at 200m/650ft and 1280x1024 at 300m/1000ft. The AdderLink X2-MultiScreen applies a high level of signal compensation that allows for a greatly increased range of very smooth and fine adjustments. The X2-MultiScreen also offers its own brightness correction to ensure that the image is crisp, clear and bright, regardless of the distance and is individually selectable per video head. This dual multiscreen extender features 300MHz DeSkew circuits which compensate for any skew effects that may be introduced by long CATx cables. DDC circuits are also fitted to enable the computer to query the monitors so that the video cards can be optimally configured. Without this circuitry, some well-known high performance video cards cannot be used at high resolutions. The AdderLink X2-MultiScreen units ensure that the transmitter and receiver clocks are synchronized to ensure that no audio is ever lost or added, thus preventing annoying audio clicks. Spike suppression - The X2-Gold Dual Access is fitted with spike suppression circuits. Application - The X2-Gold Dual Access is not suitable for linking between buildings.